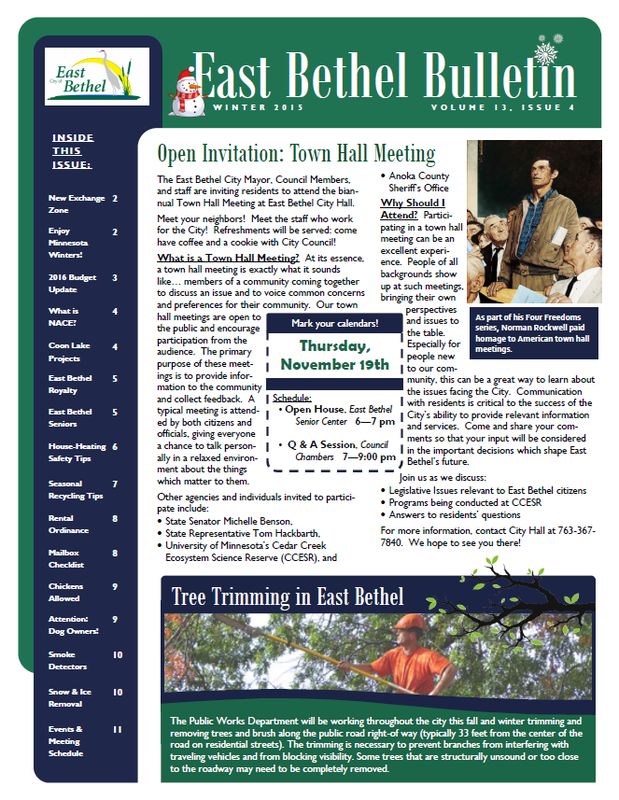 The East Bethel Bulletin newsletter is published quarterly, and is mailed to all households and businesses in the city. In an effort to provide an up-to-date publication that keeps the readers connected to their community, the Bulletin is packed with city news and information about municipal programs, projects our city departments are working on, important seasonal reminders, and upcoming events taking place during the three months the newsletter covers. The East Bethel Bulletin is partially funded with revenues generated by advertising. Call City Hall at 763-367-7840 or email Carrie Frost with your suggestions and comments, or if you wish to advertise within the newsletter. The East Bethel Bulletin is available online as a PDF document. Click on one of the links below to open the most recent edition of the newsletter, or to select another issue from the archives. You need the Adobe Acrobat Reader© to view and print PDF documents. Download the free Acrobat Reader from Adobe's website.